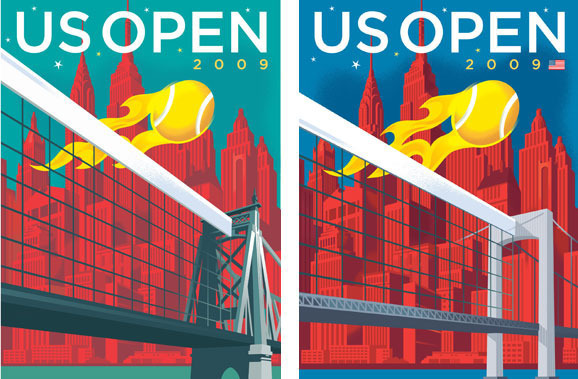 I designed the US Open Tennis Championship Theme Art for 2009. The artwork will be used on posters, banners, tickets, programs, t-shirts, and every kind of souvenir you can think of. 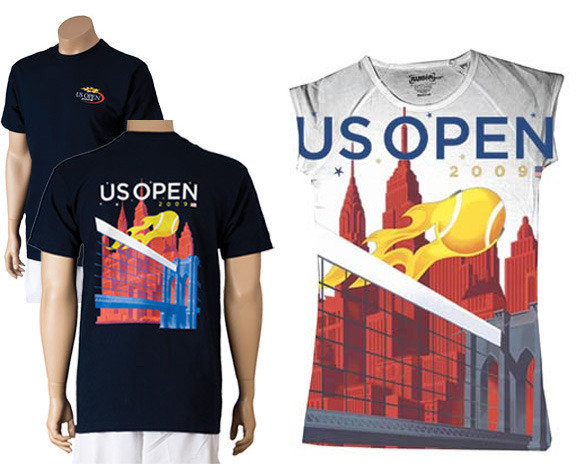 Marc Jacobson of the Silverman Group called this winter to see if I’d submit some designs to the USTA. Every year they pay a few artists to produce a couple of ideas for presentation, the USTA picks one, and that’s the theme-art for the tournament. Marc liked a number of the sketches and I developed six color images for presentation to the USTA. On a project like this I tend to over-produce these “concept sketches” because I don’t want to lose the project because I delivered half-hearted execution of an idea. This process is always a gamble, and having more cards on the table sometimes produces a winner. During the pencil-stage I thought I could successfully execute a strong treatment of a player that would be generic enough to be either male or female. But as I tightened up the image, the figure kept tipping one way or the other, or it just looked like a dude in a skirt. This is the design that I most wanted to be chosen. 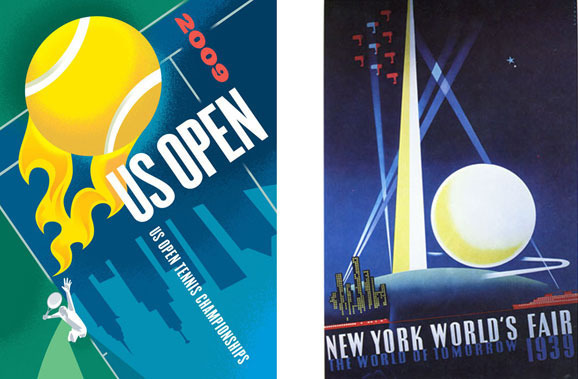 It makes reference to the classic Joseph Binder poster for the 1939 World’s Fair at Flushing Meadow in Queens, the current site of the US Open. Clearly, no one got that reference but me. Everyone liked the bridge/tennis net idea. The Brooklyn Bridge doesn’t exactly lead to Queens, so we looked at some other bridge options. In the end we kept Brooklyn as the strongest symbol of NYC. Merchandise and souvenirs are starting to show up now. There’s a crazy amount of applications for the image. you aced it. nice serve. Truly gorgeous. I had that World's Fair poster in my studio for a long time. And I want this one. Signed if poss. (Please put up a good link to a store!) Congrats Paul. Wow! Beautiful on so many levels. I love the player in the buildings also. And the poster looks surprisingly well on that shirt. Holy crap, this is so cool. I want one! Beautiful stuff, Paul. Your poster caught my eye this past weekend as I was getting off the train at Shea Stadium. 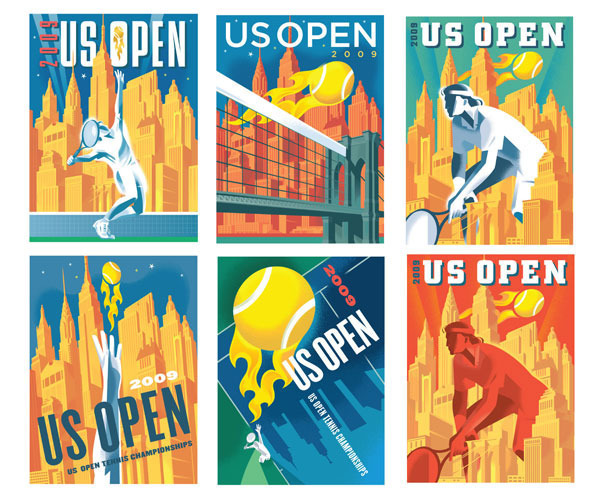 The USTA has used some really nice artwork over the last few years. I think this is one of the strongest that I can recall. On a somewhat related tangent I recently submitted a U.S. Open cover idea to the New Yorker that incorporated the remnants of 1964 Worlds Fair. They didn't go for it either. Beautiful, beautiful work, Paul. I especially like a few of the pieces they didn't choose, but the final poster is phenomenal. Very cool they use illustration too. Wow nice job. Great color, structure, the whole execution. It's a big classy image for a big classy event. It feels like Federer's execution, total pro. I really like this poster design for it's Major and Minor compositional force, and it's composition of circles. Way to go Paul. Wow, what a sweet gig. I think the composition they chose with no figure was the way to go. Well done indeed. Cool stuff! I don't follow tennis much but wasn't the US Open in Farmingdale, Long Island? Before I moved there was all activity there for the Open. Correct me if I am wrong. I guess I was thinking if it was, what does NYC have to do with it? Proximity? Never the less, that doesn't take away your the great execution! Blasting tennis ball! Dynamic and beautiful, Paul. Excellent project and smart, beautiful solution(s). Congrats, Paul. Really nice work, Paul. I can relate to your need to over-produce sketches... Don't you also find that the deeper you get into something like this, the more ideas blossom? So... you don't stop drawing! Terrific! Thanks for sharing the process as well. Always enjoy seeing the nuts and bolts parts of an assignment. Love the white T-shirt with design filling the space so powerfully. Congrats. Thanks for all the nice comments and tennis puns everyone. Scott: That was the US Open Golf Championships in Long Island, they play tennis at the USTA Tennis Center in Queens every summer. John: I tend to over-produce this type of presentation to land the job, you never know which one the client may pick. When it works out it's great. You managed to make that flaming tennis ball actually look good. The generic player thing never works. What do they expect if you're drawing an athlete wearing a scant amount of clothing? Now some of those 250lb tourists I saw last week could be made generic..! Finally a US Open poster I'll want to own..! Congratulations..! Good choice going with the Brooklyn Bridge... that is classic art director. "But the Brooklyn Bridge doesn't go to Queens!" yeesh. Really nice Paul! !...the Binder caught my eye too! Great work in a classic style. Thanks for sharing the evolution of a quality poster.